scrum geo1 | scrum master | agileAgile coaching, teaching and fun! Somehow somebody told me about the AgilEEEC. I was not aware of its existence. I think team members in Kiev proposed me to join them going there, promising me it would be very interesting. Upon checking the program, I noticed that the program was still to be determined and that the conference was open for submission. Could I? Should I? I could, yes…. But will I have a valuable contribution? On the way home from work in my car, I was thinking about the poor result I had from Kiev team members in that day’s retrospective. Remote teams and participation is difficult. Giving this problem a bit more thought, I realized I had taken some essential steps already to solve issues some months earlier by rearranging teams. I began to see that the path I had been following to mitigate the negative effect on productivity and effectivity of meetings might be valuable to share. 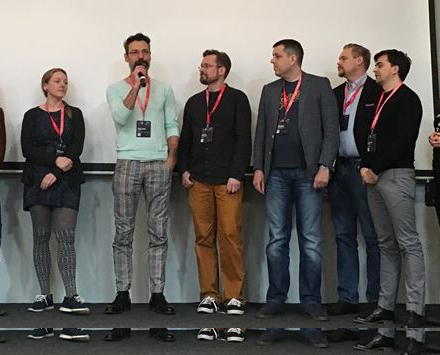 Come to think of it: Kiev is a large near-shoring capital and this conference is aimed at coaches and scrum masters: I just found me a subject that might be valuable enough to share: Remote team facilitation in large scaled scrum. That night I struggled on getting my ideas condensed in writing. The next day I shared my pitch for review with a couple of colleagues and agile-soul mates to see if I was getting my point across properly. Within 3 days after the initial idea, the conference committee received my application. I was waiting anxiously for a response. Nothing. Day after day. I started to doubt whether this whole thing actually was a good idea. Should I contact them to find out what is happening? Would that look too pushy? I convinced myself that a light and small note to ask about the process might be harmless. I got an instant reply from Lina, the conference coordinator: My pitch sucked BIG TIME. She did not put it that way, but that was what it felt like. She liked the subject very much, but it was not “sellable” enough…. “Better take a look at what the others do”, she wrote. And so I struggled for three nights reading and re-reading the pitches of the other applicants. I started to see a pattern in how they did it. There was a clear “what’s in it for me?” message in all of them. And a brilliant one-liner. I got it, nailed it and mailed it. I paid attention not to mention the sweat it had taken me to deliver this transformed pitch and added a neutral: “Hope this is more what you’re after, cheers, ro.” to the mail. That was it. “YES! I’m in!” My instant happiness was immediately chased by the realisation I did not have a clue how these things are done financially. I consulted my conference-friendly co-coaches and learned that “it all depends…” (Great help guys). Transparency would help me out I thought. So I calculated what it would cost me if I were to pay everything myself and wondered if I would be willing to spend that money for this experience: What’s in it for me? I reckoned that being able to share my story on a stage and possibly getting a recording of my session was a very good boost for my ego and maybe for my career. I put myself in the position of “nothing to loose” and was open for any proposal that could make it better. I verified with Lina how the financial side would look like. The organisation would cover for my expenses…. Wow! I was starting to feel like a real rock ‘n roller. I was thinking this talk of mine maybe might not be appreciated by the companies I currently work for. What if they would fear I would be sharing details that would harm the carefully designed and nourished branding these companies have been craftin for years? That was a very negative thought, I admit. But it made me realise I’d better inform them about my plans. And so I did. What I actually did, was packaging the message of my admission in a request for cooperation. Both companies wished me lots of success. That was it. I heard later that Levi9 decided to sponsor this edition of the conference. So far so good. Getting the material together actually was the easy part. I was starting to film and photograph daily life to fill my presentation with. I organised my thoughts in a mind map and created a presentation in Keynote. Some day at work, Emile, a colleague scrum master who would also be attending the conference, asked me how things were going with the lecture. I replied: “It’s progressing ok-ish, and I’m sure to have it all in place within the coming two weeks.” “TWO WEEKS? !”, He replied and laughed. “the conference is this Thursday!” Oops,… this meant I had less than a week to get it all sorted. I quickly proposed to dry-run it on him the next day. The dry-run was valuable giving me good feedback. The main thing to improve was to spend less time on the first part of my slides and make my reasoning more clear. Like a TED talk… Ah yes,…Ted talks… Why didn’t I think of this before? I always want to invent everything from scratch. I have to learn to start by copying from the best for faster learning. I am still shooting information that could be of value for my talk: Problems with technicalities, partying people, our cultural outing. It allowed me to add a couple of last minute slides to give the slide-deck a here-and-now feel. I also found a couple of glitches when rehearsing the talk in front of the mirror in my hotel room. Trust me, a mirror is a harsh feedback tool. There is a day-opening where all ‘speakers of the day’ pitch their talk to persuade people to join their talk. I need to prepare that. What do I need to do to stand out in the crowd? I consult the other activities going on during my time-slot. It looks like I’m lucky: nothing special and nothing similar to my subject. So how can I get the people to join? Maybe I can pretend the mic is failing and talk in snippets with dropouts? Maybe tell a joke? I’m not very confident how to approach this. “And let’s have a big hand for all speakers of today! Please come to the stage, guys, and introduce yourselves!” I have chosen my seat in the venue strategically so that I can be one of the first to get on stage. This pole position could make it easier for me to have the others group around me rather than me trying to squeeze myself in. Because like everyone else, I am trying to avoid being the first to speak. With every participant delivering their pitch, my heartbeat increases. It increases to a point where I am wondering if I will be suffering from a blackout our will need to hold the mic with two hands not to tremble. Why did I ever decide to to this? I look at Berglind. The stunning Icelandic coach calmly delivers a relaxed pitch about the Imposter syndrome. I promise myself to be calm. I am not an imposter! I have a good story to tell! I need them to know what they are going to get. Love the mic! She looks up in my eyes, smiles and passes the mic. I hold it close to my mouth, breathe in and look the audience in the eye. “So why am I here?” My voice resonates through the sound system. I know it is ok. Simple sentences. Slow down. Let your voice be pleasant and make it carry. Control is everything. Don’t forget to mention the time. Applause! I pass the mic. My heart rate leaps up one last time. I feel a jerk in my cheek. Where did that come from? I don’t hear anything. He’s done with this pitch. I clap my hands. For him. To support him. But primarily for my own relief. Everybody claps their hands. I’m calm now. This entry was posted in events, Everything, story by roland flemm. Bookmark the permalink.